Todd Starnes is not your father's Rockefeller Republican. He is, rather, part of the new breed of rabidly right wing Republicans who, whilst braying about their freedom, seek to curtail rights for minorities, women, and gays. As a member of the radical right, Starnes embraces the kind of paranoia once reserved for communists. In addition to fearing creeping Sharia and the "gay agenda," Starnes seems to have embraced Jim Crow stereotypes of African-Americans as lawless barbarians - stereotypes that are still promoted by white supremacists. Last year, he tweeted that blacks were rioting at Burger King. The story that he linked to did not mention race. 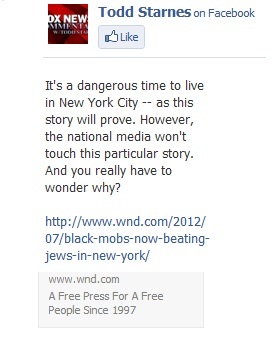 Now, on his Facebook, Starnes says that living in NY City is dangerous. After noting that the mainstream media is ignoring the story, he links to a World Net Daily article "Black Mobs Now Beating Jews in NY." Along with WND (and the Murdoch owned NY Post), this story is featured on a number of white supremacist websites including the Council of Conservative Citizens. Can we talk race baiting? The World Net Daily article sources from the NY Post article about an "anti-Jewish crime wave." According to the post, "hate mongers" targeted Brooklyn’s Orthodox community with a vicious assault, a string of synagogue thefts and anti-Semitic vandalism targeting synagogues and Jewish neighborhoods." The NY Post notes that a "mob" of six black teenagers shouted anti-Semitic epithets at a Jewish man as they were assaulting him. No mention was made of any charges filed or arrests. But the World Net Daily doubles down on the race baiting with comments like "The assaults are part of a larger pattern in the New York area and around the country: Black mobs assaulting, robbing, destroying property and creating mayhem – hundreds of times in more than 60 cities." WND has no evidence of this black crime wave except to note that "much" of this "lawlessness" perpetrated by "black mobs" is on You Tube. They also claim that "violence from black mobs" is not covered by the press. They then post a litany of black "mob violence." Thank god for his sisters. Because living on an island with his thoughts means he would be all alone. In 2000, there were 602 groups that were extreme enough to be deemed White Wupremacists. In 2008, there were 926. Since the advent of the Tea Party, recruitment from major leaders like JT Ready and Steve Smith has created so many offshoots that no one has a working number, and the estimates are on a “your guess, my guess” basis. Let’s see them talk about that.